Learn more about section three by looking through the rest of this help topic. Or, as an alternative, click on the menu item you are interested in on the screenshot above. When the midweek meeting was initially changed back in 2016 there used to be a presentations item during the first week of every month. The meeting format was changed again beginning January 2018 and this item was replaced by 3 smaller items during the first 3 weeks of every month. At the moment I have left the obsolete controls visible (but disabled) in the editor. Eventually they will be removed. Use the button to display the Student Assignments window. You populate the student assignments in exactly the same way as you do for the Bible Reading assignment. Click the symbol to display the Student Selector window and choose the student / assistant. The study number is automatically filled in from the Student Material information (when in 2019 mode). Please keep in mind that there is no Assistant if the student item is designated as a Talk. Please also keep in mind that your LMMO could populate all this information and then export it. Then all you need to do is import it. 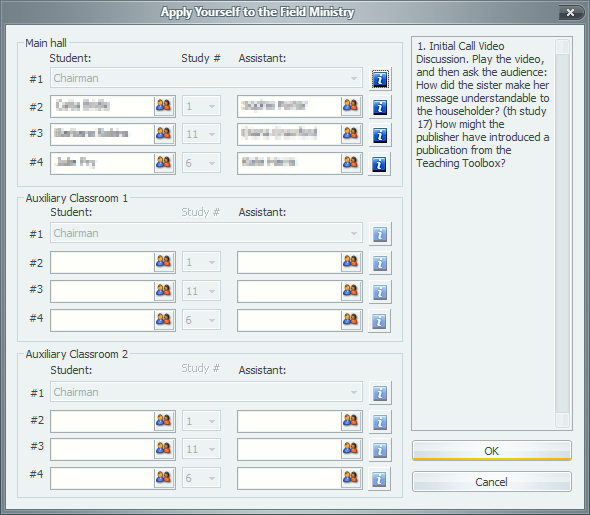 The auxiliary classes will be enabled if the classroom options have been set in the editor. Finally, you can click on the information symbol to see what the type / material is for the chosen student item. Use button to specify or adjust the student assignment type and material. You can use special HTML tags with the material text. <i> </i> will do Italics. <b> </b> will do Bold. Under normal circumstances you will not have to display this window since the volunteers who provide the monthly data will fill it in for you. However, if you are using a language that doesn't have a volunteer, or if you are preparing your schedule in advance of the volunteer then you will need to specify this information. Use the drop-down lists to set the student assignment type and don't forget to set the correct timing for each item. You should also select the study numbers here (if in 2019 mode). You can type in a new assignment if required (it depends on the information provided in the workbook). You can add new entries to the list by using the customize lists feature. You are a monthly volunteer. You are using a language that does not have a monthly volunteer. A small pop-up window is displayed when you press the button where you can select which week you would like to reset to. The controls will then reset to an agreed set of default values. Play and discuss the video. Begin with the sample conversation. Overcome a common objection. These are only default settings. At the very least you will have to change the study numbers once the reset is complete. In addition, you should have a quick glance over all the controls as you might need to fine tune the results to match the workbook for any given week.